1. Drain the halloumi, pat dry on kitchen paper and cut into 5mm thick slices. Heat the oil in a frying pan and fry the halloumi for 3-4 minutes on each side until golden. Transfer to a plate and keep warm. 2. Add the courgettes to the pan and fry for 2-3 minutes to lightly colour. Stir in the pack of lentils and the stock. Heat through for 2-3 minutes. 3. Stir in the tomatoes and cook for a further 1 minute. 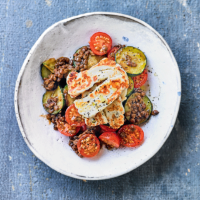 Transfer to serving plates and top with the halloumi. This recipe was first published in Thu Jul 06 09:59:00 BST 2017.